Paris has long been regarded as a cultural epicentre; not just of fashion, but of style. While some of the world’s biggest luxury brands call the City of Lights their home, it’s Paris’s inhabitants that have captured the world’s collective eye. Whether taking a break at a café, running errands or just strolling around the arondissements, there’s just something about Paris that brings out that laid-back style. Get some of that style savoir-faire for yourself with the latest from A.P.C. and Maison Kitsune. Both hailing from Paris, these two brands capture their home city’s vibe perfectly through their use of classic patterns, relaxed cuts and playful graphics. We’ve highlighted some of our favourite pieces in our latest editorial shoot. It may not be Paris, but it comes pretty darn close. There’s no simpler men’s style technique than ‘high-low’ dressing: that is, pairing something considered traditionally smart with more casual pieces. Take the combo above, for example: while the APC coat is of a classic ‘Balmacaan’ style, the custom-woven fabric is spring weight and lightens the silhouette considerably. Meanwhile, the Maison Kitsune t-shirt is one of the more subdued pieces in the brand’s lineup, but holds its own thanks to the slubby cotton jersey and superior Portuguese construction. Both pieces complement each other effortlessly for a smart-casual double whammy. Combine this with the glen-plaid check pattern of the A.P.C. coat and the muted graphic on the Maison Kitsune t-shirt for extra Paris-points. There’s probably no more stereotypically ‘French’ garment than the striped long-sleeve t-shirt, so it’s no surprise one would appear here. For decades, actors, musicians and general cool people have turned to the classic mariniere as part of their daily uniform. It’s no surprise — they pretty much go with anything, from workwear to cutting edge capital-F Fashion. This version from Maison Kitsune is a beauty, constructed from a satisfyingly weighty jersey fabric and finished with the brand’s signature Fox logo. We paired it with A.P.C.‘s upscale take on the traditional bleu de travail French worker’s jacket, which elevates the functionality of the original with a textured fabric and metallic buttons for a contemporary take on classic Gallic garms. Still on an elevated workwear vibe, the above outfit is based around A.P.C.‘s two-piece Job set. Comprising an overshirt and a pair of straight-leg carpenter pants, the ensemble swerves away from painter-decorator territory with the use of a luxe striped fabric, delivering the typically Parisian skew on Americana that only A.P.C. can provide. Wear the full set or mix and match the pieces with your existing wardrobe — the trousers in particular are something special, complete with the full complement of utility pockets and hammer loop. Throw on one of Maison Kitsune‘s beefy-yet-refined hoodies for the chillier days and you’re set for Springtime in Paris (or wherever else you happen to end up). Check out the brands’ pages for even more of the good stuff, and make sure to keep an eye on our social feeds for the latest drops. We’re up to our eyeballs in hot off the press Spring Summer gear and surprise, Surprise It’s all exceptionally nice. Whether AMI’s your thing, you have a sweet spot for a good pair of trainers or you just can’t contain yourself at the sight of a compass patch, if you want it, we’ve more than likely got it. So, in the spirit of fairness, we thought we’d bring you a comprehensive list of some of the pulse-raising clobber you can currently get your hands on as well as some of the stuff that’s soon to be up for grabs. This new iteration of the classic Albam zip-up sweatshirt certainly stole some looks when it came through our doors. Made from their quality signature cotton loopback in both a navy and ecru colourway, it features panelling to the elbows, a handy front kangaroo pouch and elasticated cuffs for a better fit. Not only that, but thanks to it’s half-zip, funnel neck combination it provides some interesting layering options. Wear it under a lightweight coat, pair it with a nice button up shirt or wear them both on top of one another, you can’t really go wrong when you’re wearing a sweat this nice. Who doesn’t love a jacket with loads of zips and pockets? No one that’s who and these CP Company jackets are exactly why. Made from the brand’s unique multifilament nylon that’s undergone the mystical CP garment dyeing process it features a 4-pocket utilitarian design that’s perfect for keeping personal possessions and old bus tickets safe. Lightweight, breathable, water resistant and available in both a red and blue you can find the iconic goggles to the hood and both a half-zip and full-zip entry options. If someone asked you to sum up CP Company in jacket form this is more than likely what you’d come up with. What can we say about these trousers from Oliver Spencer? Well, for starters they have a relaxed casual fit with a slight taper and cropped length that’s perfect for contemporary styling. On top of that, they also come made from a mid-weight cotton that not only lends itself perfectly to the earthy olive colourway but embeds the trousers with some robust, long-lasting qualities. Finished with the addition of a side patch pocket to one leg for some workwearesque details they will be available very soon so keep eyes peeled and fingers at the ready. Another of our favourites when it comes to things you wear on your legs. Aptly named the job trousers this latest offering from APC continues on the workwear theme boasting a straight cut, patch pockets to the sides and a trusty hammer loop. Made from a soft, lightweight Italian cotton drill the true star of the show here is undeniably the visually pleasing striped pattern embedded from seam to seam. If you’re looking to impress the gaffa these are the trousers to do it. Coming very soon along with a matching, similarly delightful overshirt. Next on our ones to look out for list is this corker from AMI. Featuring a number of modern shakeups to the classic scrum-ready formula including a bold stitched panel striped design, a super boxy cut and contrast AMI logo proudly to the chest it promises to be a firm favourite no matter your sporting preference. Not only does the distinct colour of this Stone Island overshirt remind us of a fresh lemon sorbet but it arguably presents just about the same melt in the mouth qualities. Made from a brushed cotton canvas that’s garment-dyed using the OLD effect, that Stone Island describes to us mere mortals as providing a vintage-inspired worn-in look, the overshirt comes with a zip and patch chest pocket as well as a removable sleeve compass patch. Continuing on the Stone Island theme this monochromatic beauty certainly caught our attention. Part of the Stone Island Ghost Piece Capsule it’s made from a cotton and nylon blend and comes complete with two front patch pockets with side entry compartments as well as ribbed cuffs for a better fit. Designed in an over the head style the overshirt is finished with an adjustable clasp drawstring hood and the all important tonal removable compass patch to the arm. Raising the bar when it comes to things you can do with cotton Norse Projects present the latest reimagining of their wardrobe staple Niels t-shirt. Using a heavily textured towelling for multi-sensory appeal, the t-shirt retains the same levels of minimalism expected from Norse with a ribbed neck and subtly branded patch to the seam. Available now in a muted ecru and deep olive. A favourite among sneakerheads, dads and fashion-forward individuals alike the New Balance 991 has been given a luxurious update ready for when the weather heats up. With breathable mesh uppers and premium suede overlaid panelling, the trainer sits atop the signature ‘motion flow’ sole unit with visible Abzorb foam and reflective gold detailing. The best of both worlds when it comes to functional comfort and aesthetically pleasing design. Drawing inspiration from typical military wear the Tempest anorak from Ten C is your new best friend when it comes to dealing with the unpredictable trans-seasonal weather. Engineered from a spring-weight nylon fabric that not only posses an exceptionally soft feel but intrinsic water repellant properties, the jacket is finished with large two-way entry pockets, a number of reflective details, including the brand’s rosette logo to the sleeve, and a multi lace adjustable hood, utility garment lovers rejoice! Trends are funny old things. One moment you’re retiring the denim jacket from the champagnes and the campaigns and within a blink of an eye it’s back as the quintessential layering piece. C’est la vie, as the French say, amongst other things, such as; Roll Necks are this seasons must have layering piece, especially this pink piece from Paris’ own A.P.C., amongst contemporary design from Comme des Garçons SHIRT & Maison Margiela. Has layering gone too far? Can it go too far? Is knit on knit a crime? Can 2018 be the year we allow same knit’s to live with one another in harmony? 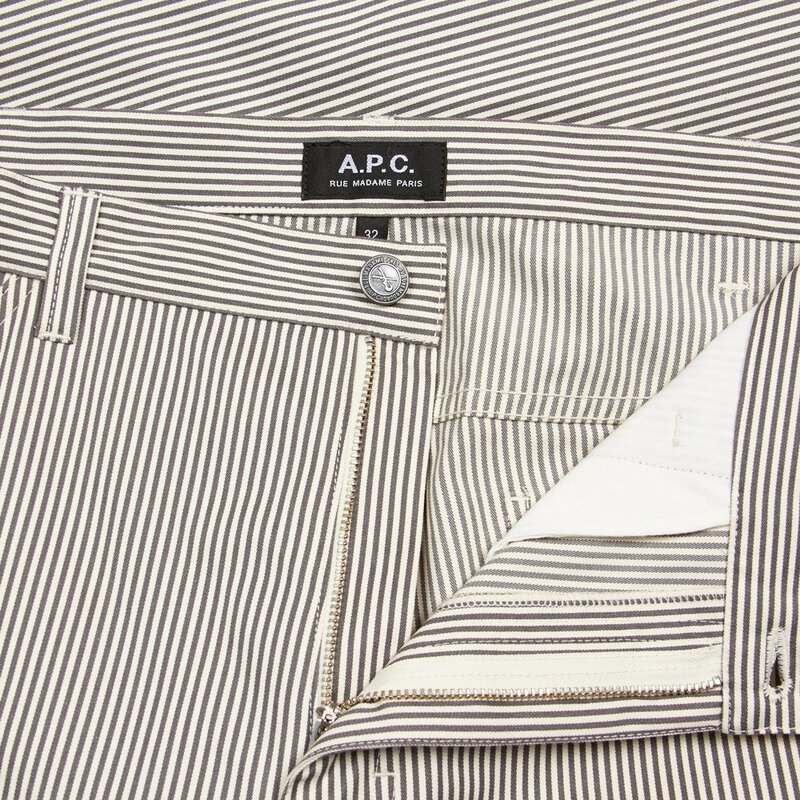 Questions that aren’t for us to answer, but this Ami on A.P.C. action makes a convincing case. Who dares wins, and in this coldest of winters it’s worth investing in a daring selection of classy cold weather warmers. Practical, stylish, contemporary with a touch of classic heritage influence? It’s all in Ami’s prerogative with their Ami De Coeur range that mixes the best of menswear design with the sensibilities of streetwear. Whether it’s the office after a nice long holiday or time with the kids, jammy students to college or uni after campus shutdowns, we’ve got everything you need. For the tardy ones perfecting that morning speed walk to the work base, these adequately named Maison Margiela runner trainers are a perfect sub for your usual smarts. The fashion house blend of A.P.C. Minimalism and style blended with the universal deconstructed designs of Maison Margiela make for a match of monumental proportions. We’re at the precipice of athleisure dominance, so make the most of luxury comfort whilst it is still at the top of the trends. Suit swervers assemble … with AMI pulling stunts like the sublime use of the Tattersall check in this super sleek dress shirt, you can still throw on your chino trainer combo and mean business! This clean and contemporary take on staple palettes of #mensfashion is a must have for the modern gentleman. Mix quality accessories from Folk and Andersons Belts into the outfit to pair with minimal designs from the likes of Grenson and Norse. Serial snoozers know too well the mad dash to lectures, but you can be more than prepared if you up your jersey game. Season favourites from this end are Ralph Lauren and Norse Projects with a hoodie and jogger selections on point. You can roll out on the wrong side of the bed every day if you’re going to rock this simple but effective luxury leisure wear. Welcome reader. Relax, take a seat, and press play on our summer shirt feature. Drink? We thought you’d never ask. The sight of a short sleeve blue shirt strikes fear into a number of men and with justification. It can be a divisive affair, more pie guzzling than Ryan Gosling, but don’t fret we’re here to help! For menswear, there are certain brands you can guarantee to provide a simple and effective design British sensibilities. The highest of our priced short sleeves but fitted perfectly off the peg for all body types. Small details like a contrasting top button, logo tab to pocket and stripe details to the side seams give the shirt unique embellishments to push it away from its contemporaries. Although your token blue shirt is a light blue number, this deep blue creation from the Polo brand is a versatile offering that can work in casual and more formal designs with it’s contrasting blue offering a foil to most staple formalwear palettes. Crafted from a featherweight twill fabric, this is perfect as a summer shirt to air it all out. Offering a perfect middle ground to the above offerings, this mid-blue oxford offering from the laurel wreath is casual wear through and through with button-down collar, box pleat and contrasting locker loop to the rear of the shirt. For all you men in blazers, this is the section for you. Honestly, the next time you lean those elbow patches on the bar to talk about the footsie 100, you won’t look like a Richard. Clean cut, no-nonsense, and surprisingly not an eccentric offering from Comme De Garçons shirts. Show your fashion awareness with the Japanese brand’s best in men’s formal attire taking an eloquent approach to the men’s striped shirt. Kings of French cool, APC bring a minimalist contemporary air to every seasonal offering from the brand, and it’s a consistent presenting in this striped shirt with a cream and blue mix in its colouring. A timeless approach to a timeless item. This typically preppy garment might not be striped per se, but it fits our agenda and you’ve gotten this far so why should you care, this shirt is too nice to kick up a fuss. Pigeonholing this in as it’s our only Hawaiian that fits the criteria, and it’s not really a Hawaiian at that, more a box fit, box fresh, punching above its weight, casual commando in the fashion field. You see why we included this now, right? Relaxed boxy fit, soft fabric composition, multi-button collar options, it’s a swiss army knife in a shirt. The carbon fibre of the blue shirt world, the chambray is you high performing supercar in your wardrobe. More of a Tesla in Aesthetic than a Bugatti, it’s what’s under the hood that counts, and the chambray is packing some serious power. This genuinely might be the greatest shirt ever made in the history of the greatest shirts ever made. APC has the uncanny knack of knocking every garment out of the metaphorical park of quality, and this Japanese cotton clad chambray is a year-round killer. Dyed with indigo and stonewash to create a denim blue complexion it’s ‘Murica in a classy chambray design, embracing the denim colour to great effect on a casual and lightweight design. Pair with more denim for the authentic rawhide look. Norse Projects have the uncanny ability to nail the a-typical stylings of any staple garment with their Scandinavian minimalist air. When we’re eventually able to 3d print objects by verbal demand, the scream of ‘Alexa, Chambray Shirt’ will yield this exact design. Even the word ‘Oxford’ connotes a world of regal, timely gentlemen and women oozing the aroma of books and rich mahogany, taking the bimmer out for a spin to the local shop to pick up a box of earl grey in anticipation of afternoon tea and scones. It’s hard to offer a shirt selection without omitting Ralph Lauren, they’ve dominated the preppy shirt creation since the dawn of man (that’s a fact). Does what it says on the tin etc. Take the previous piece on the Anton Chambray and replace the c-word with Oxford. Consistency. To be honest, as much as I love oxford shirts, they’re just the same thing with a different logo. You cannot go wrong with the selection at hand (Unless you don’t buy any). The book ender of sorts, a good overshirt (or shacket if you’re so inclined) is the layering item you need in your arsenal. Add it to a summer wardrobe for a lightweight layer and throw it under a big coat for the winter lets focus on summer for now though. Current kings of the overshirt, Stone Island place their tech sensibilities on a metallic nylon overshirt. Fastening to the front, with a statement crinkle effect and supremo construction courtesy of the Italian maestros. Combining the shirt and a zip with great aplomb is the dark indigo iteration in the Paul Smith zip shirt. Featuring twin patch pockets to the chest and buttoned cuffs, it’s a typically subtle affair from the rainbow man, offering the classic British fashion sensibilities with a contemporary air. This is literally, at the fundamental of it all, a blue shirt, that fact cannot be disputed. It’s a blue shirt you wear over things, like an overshirt. Therefore it deserves being placed in our ‘kind of blue’ overshirts section. Plus it also happens to be a denim jacket, therefore, you can wear with any of the above items and it’ll look crispy. We’re bringing you the wardrobe cornerstones you must have, especially in this modern day and age. It can not be stated enough, the shirt is a cornerstone of a man’s wardrobe. The amount of versatility from a chambray or oxford shirt cannot be denied, allowing its wearer to choose a dress down or dress up outfit thanks to the universally applicable styling. With every brand looking to place their individual spin on the timeless design, there are a plethora of options. APC has, as usual, developed a robust offering in their Stitch Chambray shirt, offering Japanese developed fabric, a small rounded collar and slightly oversized mother of pearl buttons for a vintage look. Place a blazer on top or go solo and roll the sleeves, the options are endless. Begining its life as a sports luxe style, the sweatshirt has evolved into an essential layering item for the modern man. In its grey base colouring, it’s a staple synonymous with streetwear and menswear all around. Champion and Stussy may have established their own essential offerings, but french brand AMI has developed a contemporary creation of a classic crewneck. Introducing a splash of colour with the French tricolour colours to its chest logo and subtly branded rear neckline, it’s still the essential design with modern day embellishments. Always adopting a less is more attitude are Scandinavian minimalist experts Norse Projects, creating simple foundational pieces that provide the linchpin of the modern man’s wardrobe. The Aros is the standard light chino offered by the brand in a literary of colours, with the khaki bringing the essential colouring for a base trouser. A well-cut pair of Khaki’s lends a smarter facet to the casual vibes, offering a versatile colouring to a range of styles. A great dependable pair of denim is a mainstay of any man’s attire. It may not be the best idea to jump straight in with any raw or selvedge denim for their maintenance, but that doesn’t mean you can treat yourself to a premium pair of pants! The Grim Tim from Nudie Jeans is a modern revelation, a straight leg with a slight taper in a dry denim that doesn’t bleed blue across your favourite clothes and body but moulds and crafts itself to your legs with every wear (that is if you avoid washing them for 6 months). If this is your first foray into denim, this is your safest bet. Unless you want the most stylish Canadian Tuxedo seen this side of the century, you’ll want to diversify your bonds and pick up a jean jacket with a different denim feel. Providing a distressed and vintage style with both character and history is the Nudie Jeans Billy Shimmering in a token indigo offering and 12.5oz rigid denim. Place it under a coat for the winter or utilise it as a light summer jacket. If you need proof for how versatile the denim jacket can be, look no further. From professionals to leisure seekers, the duffle bag is your friend. Offering a no-nonsense take to the holdall, the Paul Smith take on a duffle bag remains minimalistic in add-ons with flecks of colour to the outer area provided by the cycling stripe. Adept at carrying a laptop, a suit or even just a pack lunch, the Paul Smith duffle bag provides the bare necessities of a duffle bag and then some. It’s always essential to have a hat as a travelling man, and nothing works an outfit better than a fisherman’s beanie. Paul & Shark have placed their signature anchor design to this dark grey ribbed beanie. This rugged design easily lends itself to statement branding displayed front and centre, or suits being rolled for a tighter look. Pair with the denim jacket for a classic workwear look. The classic browline Clubmaster is a staple of the Ray Ban brand, bringing the heralded business style of the 50s and 60s to the modern day with tortoiseshell frames, black arms and gold detailing around the edges. having held their own as glasses purveyors for decades, you can trust Ray Ban to keep providing the best styles possible. You know what it is. You know what it does. Don’t scrimp on the accessories, they maketh the man! Don’t get cut short on your travels, whether its miles or minutes. You never know the importance of moisturiser till your old! We present out 10 best football kits in World Cup history spanning 66-18, showcasing the most aesthetically pleasing designs that international football has ever seen. This year’s crop of kits has brought us a fresh offering on some established styles from Nike, adidas, Puma and New Balance amongst others. Taking a contemporary fashion slant to the always popular France national, Nike has updated their template for the tournament to include a simple henley button collar and a tonal gradient to the sleeves, plus a plethora of France specific embellishments to represent their heritage. Their breton stripe training kit is also worth applause for its quintessentially French display. We’re steps closer to an APC x FFA, we guarantee it. It’s only fitting that the forward-thinking fashion facilitators in the world are provided with one the most unique offerings of the current world cup. The nation that brought us Comme des Garçons and Edwin amongst others has developed an eye-catching kit consisting of a denim colour base and consistent spots flecked throughout the kit, inspired by traditional Japanese samurai warrior armour. Whilst other nations pay homage to their footballing heritage in the form of their kits, Japan is referencing their warriors of premodern Japan. On top of that, they’ve placed their traditional FA badge on the breast, with an embroidered flag above. Displaying a nice shade of oranje across their kits, the peak of Holland’s footballing capabilities also saw them peak in the kit department, decking the legendary Johan Cruyff and his men in a simple orange long sleeve with black accents. Presenting their coat of arms loud and proud, the details are sparse other than the 3 stripes of adidas seen on everyone but captain Cruyff, who famously shed his strip of one of the 3 stripes thanks to his then deal with fierce rivals Puma. Although their showings at FIFA tournaments haven’t been up to scratch, the bold and brash stars and stripes have always provided us with competition in the form of their red, white and blue kits. Their away kit offering in 2010 finally placed them at the forefront of the football world for everything but their ‘soccer’ ability. Taking cues from Polo Ralph Lauren in their sporty yet preppy look, the kit displays a vibrant sash to the frontal area, a fitting design for the world leaders in pageantry. 2018’s hosts and its former collection of states made a splash in the 1966 World Cup. Refusing outright to wear the Umbro sponsored kits of the tournament, the CCCP took their first outing in their red kits at Roker Park to beat former world champions Italy 1-0. Aided by Ballon d’Or winning goalkeeper Lev ‘Black Spider’ Yashin, decked out in his token all black outfit, it was a stylish and ultimately entertaining affair. Argentina may be associated with a lot more than just kits in this incredible year for football, but dodgy replacement quarter-final kits and goals aside, 1986 introduced the world to the quintessential light blue and white jersey donned by the legendary footballing bad boy Diego Maradona. Decking the humble cotton offering with the Argentine FAs emblem and clean crew neck, it was the simple yet effective kit that lent them a cool air whilst going all the way. Kurt Cobain had his Converse, Slash his top hat, Freddie Mercury his moustache, Diego Maradona had the best iteration of the Argentine kit of all time. Of. All. time. Another favourite from 86 comes in the form of unusual contribution from Hummel and Denmark. Commonly known as the brand who ruin football kits for bad teams, it was a perfect design spark at the right time for a thriving Danish team aided by superstar Michael Laudrup. A red and white affair with contrasting pinstriped panels and chevrons down the sleeves, it was a statement of intent from a country looking to make waves with a generational bunch of talent. Although they may not have come close to winning, they won our hearts with this wholly unique style. 2018 has seen kit designs ramped up with homages to past football heritage of all qualified teams. In the case of Peru, their current kits are a wild throwback to one of the most unique and cleanest displays in football fashion. One of the first countries to adopt the diagonal stripe to their kits, the 78 world cup saw the pinnacle of Peru’s national team journey displayed in its beauty all the way till it’s eventual quarter-final exit at the hands of Pele and Brazil. Still, one of the greats of all time made sure he was walking away with the red white displayed boldly on his chest, swapping shirts with Ramón Mifflin after the whistle had blown. It may be premature to dub Nigeria’s current offering as one of the greatest kits of all time, but we have a strong case we swear! The intersection of fashion and football was inevitable, but in the last decade we’ve seen high fashion brands adopt the sporting styles of the beautiful game to great effect, from Virgil to Gosha and all the way down to their reciprocal collaborations with Nike and adidas, we’ve seen football fashion become an accepted way to present yourself, adding a prestige. Combine all that with the hypebeast culture that dominates our fashion scene and you get the Nigeria kit, the first football top to sell out as soon as it was made available. It’s revolutionary. The grandaddy of them all, the shirt synonymous with efficiency, with 90s style, with winning, the swooping technicolour design from Germany’s very own adidas. It’s quintessential ownership for any retro football fan. Everything about its design is so ironically unique considering the contrast to its wearers, all modelled on one another. Can anything ever come close to it? The only club kit to ever be worn in World Cup history thanks to a mix up between French and Hungarian FAs, local club Argentine club Atletico Kimberley bailed the French out from a faux pas that left both teams taking the field in white. The clean green and white stripe contrasted beautifully with the blue and red lower bodies of the France team. We had to acknowledge a classic that was never donned by the 3 lions, the best blue shirt in England history, boosted by it’s showing in the timeless anthem ‘World In Motion’. New Order guitarist and singer Bernard Sumner rocks the 3rd choice kit flanked by suitably excited bandmates and John Barnes post-rap. Outfit Grid – Heatwave, must have style day to night. As a current of tropical air from the Atlantic Azores Islands hits the UK this weekend, we gear up for a scorcher of a bank holiday and what is claimed to be the start of the hottest May in four decades. Well, we know us Brits and whether its the beach by day or not, we know a beer garden, barbecue and at least one late night is on the cards, in true bank holiday fashion. Here’s a little something we put together to take you from day to night with a few things considered (comfort and coolness being the main competitors). These cotton drawstring pants from APC, in a lightweight seersucker cotton are the perfect summer pant. Smart or casual, rolled up or down loose, their versatility means you can get maximum usage which is always a massive box ticker for us! Styled here with a yellow graphic print tee by Saturdays NYC, washed denim jacket by Nudie Jeans, The Marshal sunglasses in brown mirror by Ray-Ban and grey suede sneakers from Grenson. If you haven’t been introduced to Jason Markk yet then let us make you acquainted, with a highly sophisticated range of shoe care products we can describe only as magical lifesavers you really need to add products like the repel spray here to your list of things to try, you won’t be disappointed! Ever sit and ponder what the initials for your favourite brands are for, like A.P.C stands for Atelier de Production et de Creation. Now after that small fact to start of your day, lets delve into our favourite pieces from APC this season. The first piece that inspired our ‘Parisian in New York’ edit is the NYC Sweatshirt. The Parisian brand has been majorly influenced by America in their recent collection, and it is hard to not to be especially by the city that never sleeps. We can’t get enough of the minimal style of this sweater, that follows their iconic military aesthetic with APC branding to the chest, with a subtle New York City print. The humble sweatshirt is easy to throw on with a pair of jeans, and a denim jacket if you dare to do the double, for everyday wear or it can be layered over a shirt and trousers for an evening out on the tiles. The absolute essential piece this season, kind of like a ‘life won’t be worth living without’ this purchase, has to be the APC jumper. Crafted from a luxurious cashmere and cotton blend, that ensures to give you that well needed little boost of warmth. The striped knitted stripes give out nautical vibes, with the classic APC motif not missing out on being woven in to the hype. APC don’t just take off their designer hats, when they have finished with their clothing range, they also keep working away to provide some top notch APC accessories too. One piece we just can’t wait til payday to pop in our baskets is the APC keyring. Sticking to the brand’s minimal aesthetic the brand’s logo jacquard-woven to the fabric loop with premium leather detailing and a chrome spring-loaded keeper clip.